My nephew, Chris Ferri, lives in Memphis, Tennessee. A year ago he opened Belle Tavern, a bar down Barboro Alley across from the famous Peabody Hotel. A quiet place, the tavern specializes in cocktails and whiskey and has attracted a local crowd. I’m proud of him for what he’s accomplishing. And It appears that Chris is carrying on a family tradition. His great-grandfather, Pasquale, opened a brewery in New York after emigrating from Italy with his brothers. One of them later returned to their hometown of Accettura, bought some real estate and opened a bar. I visited Memphis several weeks ago, arriving eager to see Chris and share this dose of family history. More self-serving, I also wanted his thoughts on the best things for me to do in Memphis. Chris has spent most of his life in Memphis and was a font of knowledge on what to do. Here are his picks for the best things for to do in the city. Hopefully, you’ll enjoy them as much as I did. For many, this is the most important museum in Memphis. It is in the Lorraine Motel, the place of Martin Luther King Jr.’s assassination and is an incredibly poignant place. 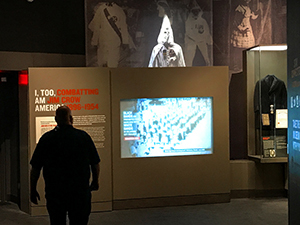 More than a museum, it is an experience that features artifacts and multimedia presentations on the civil rights movement. You’ll also find oral histories, films, listening posts and interactive media that take you through five centuries of history. 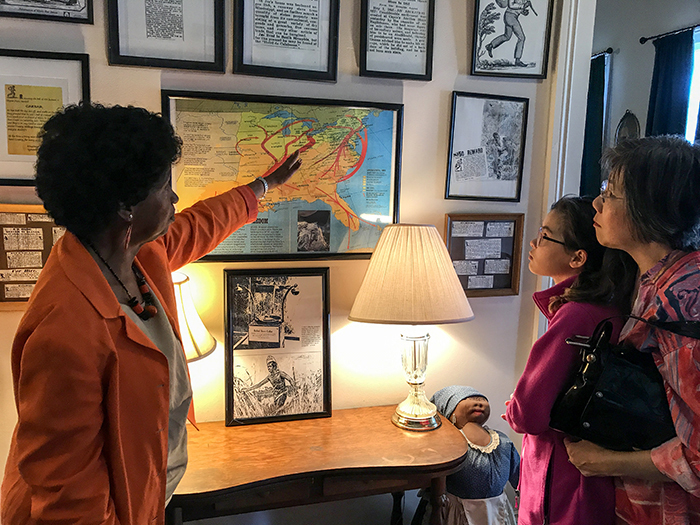 Exhibits include a bus ridden by Freedom Riders, and “Slavery and a Culture of Resistance.” The latter exhibit is set in a round room and illuminated with maps and information about the Atlantic slave trade. There are first-person accounts of life under Jim Crow laws. Incredibly, you can listen to the altercation between a transit system worker in Montgomery and Rosa Parks. The final exhibit is in MLK’s Lorraine Motel room, where he spent his last hours. Plan to spend several hours here. After hearing of this museum a few years ago, Chris told me he was amazed when he visited it. I was also; it’s a remarkable place. It’s the original house of Jacob Burkle, a German immigrant who operated a way station on the Underground Railroad. From his house, Burkle secretly ferried slaves up the Mississippi to freedom in Canada. “The Mississippi River was the real Underground Railroad,” our docent/guide Elaine Turner told us. In addition to her work at the museum and at Heritage Tours, Turner is an amazing storyteller. As we walked through the house, she brought everything to life while discussing the history of the house. In the cellar we were amazed how people could live in such a confined space, hidden from outsiders. Ensure that Slave Haven is one of your “don’t miss” places in Memphis. 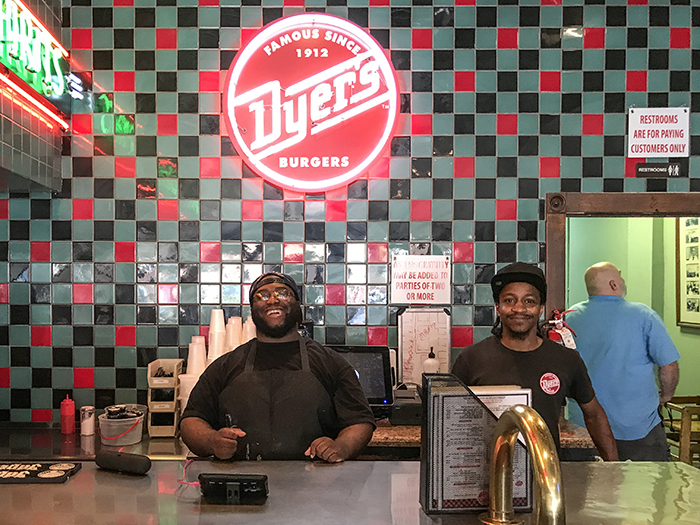 Dyer’s is a burger cafe on Beale Street founded by the late Elmer “Doc” Dyer in 1912. The flavor of its unique burgers is the result of a secret cooking process. For those adverse to burgers, it also serves hot dogs, chicken tenders, and baloney sandwiches. 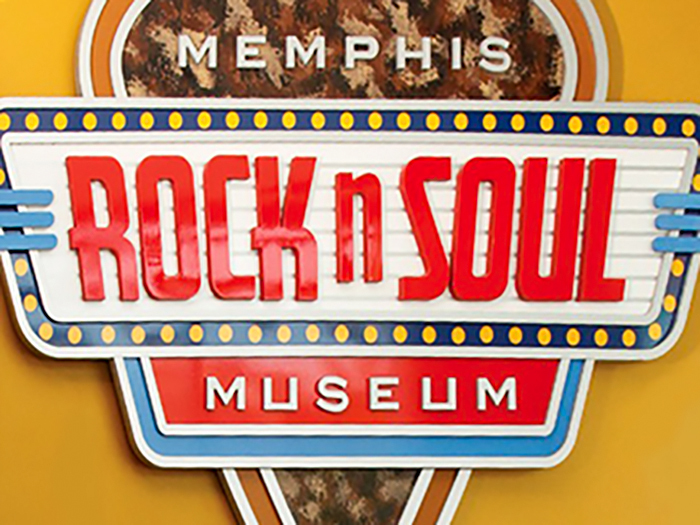 The Memphis Rock ‘n’ Soul Museum is one-of-a-kind. It’s the one museum that lauds only Memphis musicians and Memphis’s music history. The Smithsonian Institution developed the exhibition, and the museum showcases some exhibits from the Smithsonian’s collection. What’s great about the museum is its focus on musicians from all socio-economic and racial backgrounds. It’s a fun, comprehensive and educational exhibit. Just the right size, you’ll find it on Beale Street near the FedEx Forum. 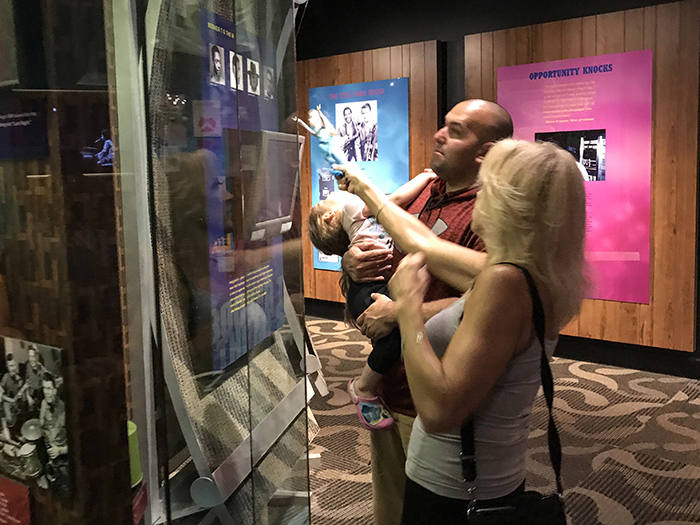 The museum also provides audio guides and maps of historic Beale Street. There are free hourly shuttles from the museum to Graceland and Sun Studio. Memphis, Tennessee may be a town built on cotton, but if you visit you better like music and barbeque. Especially music. And any lover of music visiting Memphis must visit Sun Studio. After all, it was in this former upholstery shop where rock ‘n roll was born. Sun Studio shot to fame after an unknown 18-year-old Elvis Presley walked in one day and recorded his first record. The Studio also attracted Johnny Cash, Roy Orbison, Carl Perkins, Jerry Lee Lewis and countless other legendary stars. 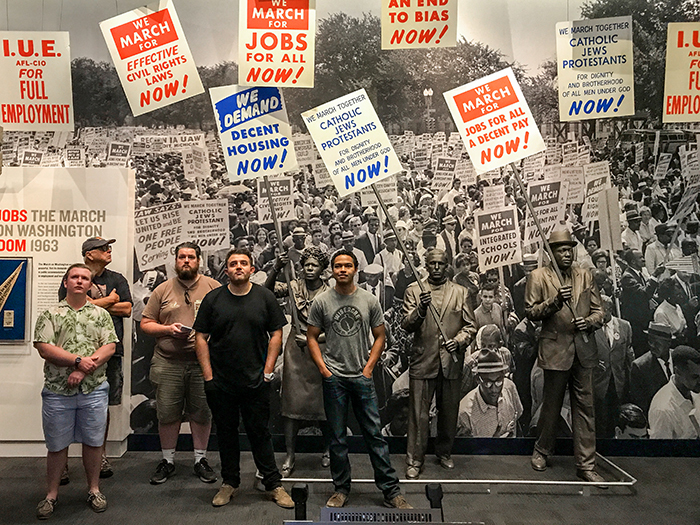 Pay a visit, and you can stand in the same spot each of them did while recording. Now a National Historic Landmark, its tour is interesting and nostalgic, especially the outtakes from some recording sessions. It’s a bit far from the downtown Beale Street area, but there’s a shuttle from the Memphis Rock ‘n’ Soul Museum. Stax Records is one of the most successful soul music labels ever. In fact, with artists including Carla Thomas, Isaac Hayes, Booker T. and The MGs, Rufus Thomas, William Bell and Otis Redding, it is second only to Motown in sales. In the southeast area of Memphis, the museum is on the site of the original Stax Records studio. It’s a fascinating museum with more than 2,000 exhibits, including films and galleries. One of the more surprising is Isaac Hayes’s 1972 Cadillac Eldorado, part of a Stax renegotiation deal. It has 24-carat gold exterior trim, a TV, refrigerator, and minibar. It’s a captivating museum that even has a dance floor for visitors. Chris raved about Mud Island, and once there I could see why. 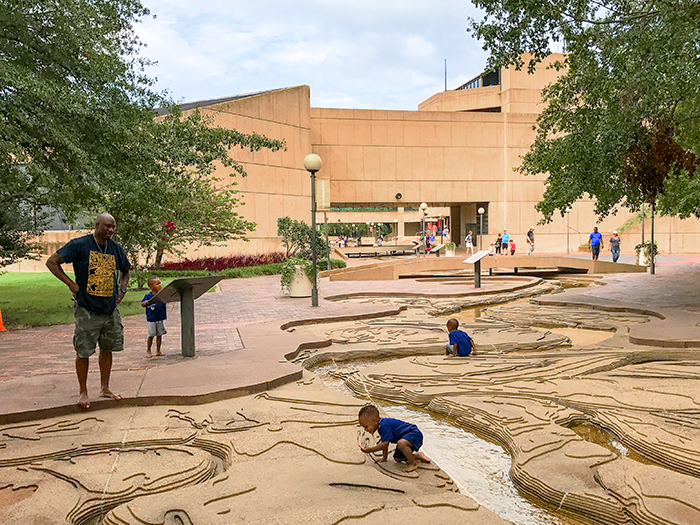 Mud Island is a scale model of the Lower Mississippi River from its confluence with the Ohio River at Cairo, Illinois south to the Gulf of Mexico, a distance of nearly 1,000 miles. The river walk, as it’s called, is almost a half-mile in length. It’s a replica of the river, designed using Corps of Engineers survey and navigational charts. It’s an entertaining and educational recreation that’s done in incredible detail, allowing you to see the river like never before. The Mud Island Museum, complete with a full-scale replica steamboat, presents the history of the Mississippi River valley. The complex also has restaurants and an amphitheater. Elvis Presley’s home, Graceland, is the best-known tourist site in Memphis, if not all of Tennessee. 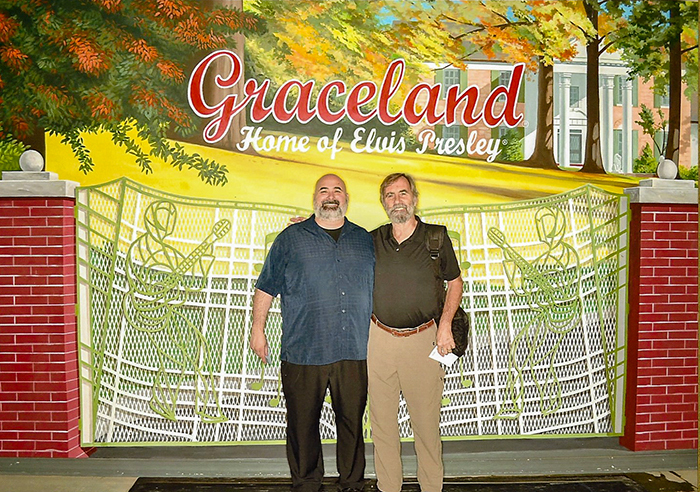 Incredibly, although Chris has lived in Memphis 34 years, he has never visited Graceland. I remedied that. On 13+ acres about 9 miles from downtown, it’s a marvelously kitschy homage to the “King of Rock ‘n Roll.” Astoundingly, it’s one of the most-visited private homes in America, second only to the White House. Elvis’s grave, along with those of other family members is on the property. The once-quiet property has morphed into a huge complex. 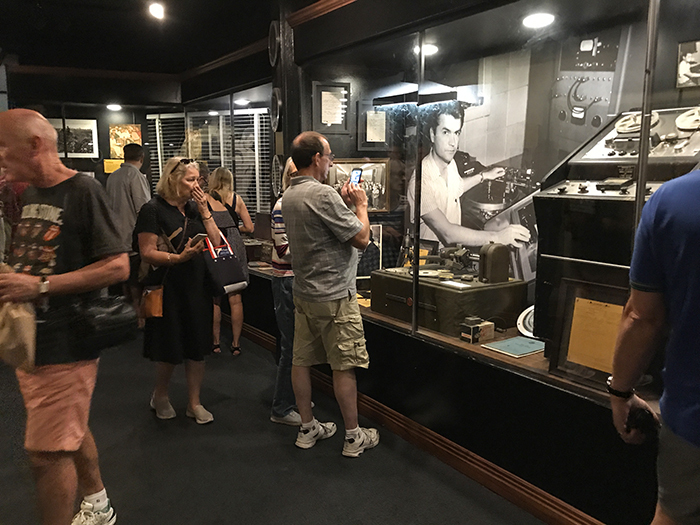 There’s the “Elvis The Entertainer Career Museum” with an extensive collection of personal memorabilia. And the Presley Motors Automobile Museum with his Pink Cadillac, Stutz Blackhawk, 1956 Cadillac Eldorado, Dino Ferrari, and more. 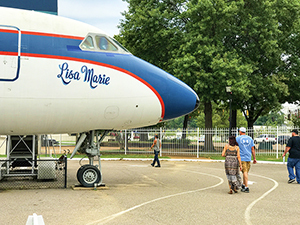 You can walk through the “Lisa Marie,” Elvis’s plane with a private bedroom, gold-plated seat belts, and 24-karat gold-flecked sinks. And eat in Vernon’s Smokehouse or Gladys’ Diner, two restaurants on the premises. If you really want to do Graceland right, you can also stay at its four-star Guest House. And, as you might imagine, there’s the ubiquitous gift shop with the largest collection of Elvis memorabilia in the world. None of this comes cheaply. Prices for adults range from $34.90 (mansion-only self-guided tour for seniors) to $159. (A multimedia iPad narration provides an overview of the house for the basic self-guided mansion tour.) The $159 Ultimate VIP Tour includes a small-group guide, access to everything and a meal at Vernon’s. Chris took me to Central BBQ since it’s one of his favorites. It’s now mine as well. Inside it’s loud and colorful with people at tables attacking piles of slow-smoked, Memphis-style ribs and pork. According to the menu Central rubs the ribs with a special “rib rub”, marinates them overnight and slow smokes them to perfection. You can get them wet or dry, or half and half. They also serve hot wings, brisket, chicken and turkey among other things. Out back on the patio, a band plays for those who want some entertainment. It’s all just laid back Memphis with great barbecue and cold beer. Memphis is a very laid-back city. That is except Beale Street, which is anything but laid-back and quiet. 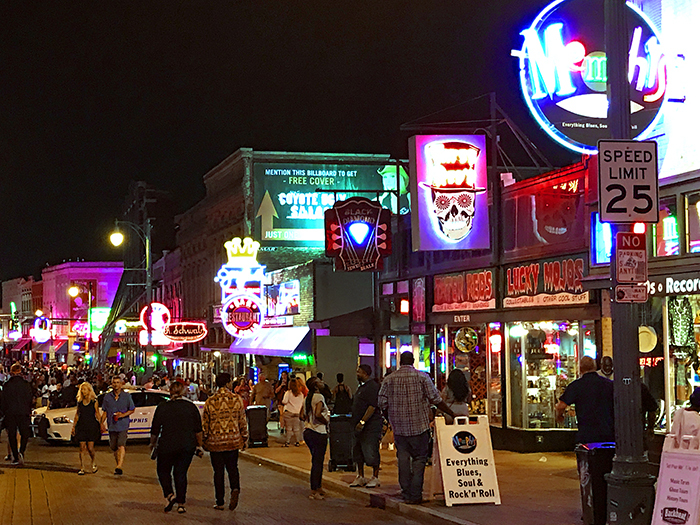 Beale is the beating heart of Memphis, a place of bars and barbecue, neon and the blues. It is where the blues were born and where many well-known musicians – including B.B. King and Isaac Hayes – got their start. As you’d expect, like Bourbon Street in New Orleans it is quite raucous at times. That’s especially true at night and on the weekends when the beat picks up dramatically as live music blares from countless bars and crowds clog the street. It’s rather tame during the day, with shops selling memorabilia and clubs luring customers in for lunch and a drink. Later in the day, you’ll see the Beale Street Flippers, an acrobatic group seen on America’s Got Talent. Just stay out of their way as they do their multiple flips down the center of the street. Oddly enough, the Peabody Hotel’s famous ducks are one of the most popular sights in Memphis. At 11 a.m. every day five mallards waddle into the lobby and jump into the Peabody lobby fountain. Later, at 5 p.m., they head back to the elevator for the ride up to their rooftop Royal Duck Palace. Each time they’re accompanied by the tune of John Philip Sousa’s King Cotton March. It’s a tradition dating back to 1933 when the hotel’s GM and a friend returned from a hunting trip. After imbibing a little too much sippin’ whiskey, they decided to put their live decoys in the fountain. The reaction among guests was greatly enthusiastic and now continues, more than 80 years later. 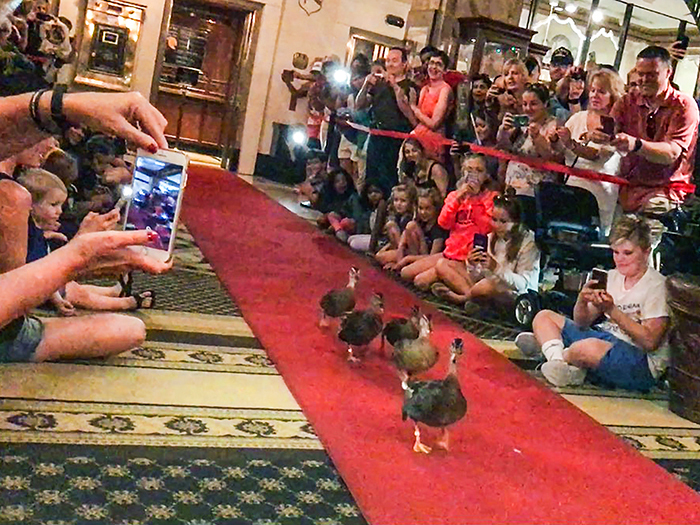 As you might expect, the hotel does attract a small crowd for this quacky event. It’s best to get a seat along the red carpet about an hour early. There’s also a good view from the second-floor lobby balcony. Afterwards, waddle down Barboro Alley to Belle Tavern for your own sippin’. The closest I came to Memphis the last time was Tupelo, Miss. The previous time was driving to Vicksburg,Miss. Heard Mark Cohn sing his song “I’ve been walking in Memphis” when he opened for Bonnie Raitt. Always had a history as being a tough town but with a lot of grit and the meeting of music genres. Will make it there one day. I went to Tupelo on my way up to Memphis. Had to see Elvis’s birthplace, even though it’s quite kitschy. Glad I sent, though, since it’s so close toe Memphis. Memphis is a great place to visit. Congratulations! Your bar sounds like a lot of fun, will look forward to sampling the wares. Memphis has always been on our weekend list and this might just clinch a visit. For anyone interested in casino gambling and concerts, Tunica, MS, would be an interesting side-trip from Memphis. It’s less than an hour south and close to the Mississippi River. Jim, I really enjoyed this article and pix of you and Chris having a great time. We have never been to Memphis and hope to get there sometime and press Chris into tour guide service as you did! Hi Pat, you really should visit Memphis. It’s a great place for a long weekend trip. And that music stirs up plenty of good memories too! I love the local perspective of this article. It’s crazy how much you and Chris look alike! I saw the similarity also. I’m glad you liked it. Come one come all. We will have a great time. Was there many years ago with Bob — went to Graceland & Beal Street. Did not know there are so many other places. Will have to return some day and look up Chris for help. Great to see you and Chris together. Thanks Wini. 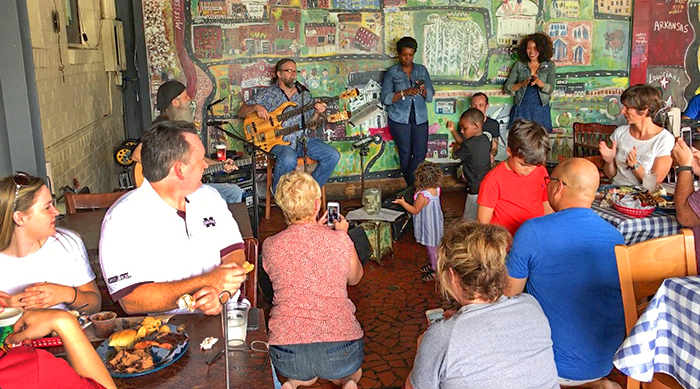 There’s a lot to do in Memphis beyond Graceland and Beale Street. And go hit Chris up for a drink or two. 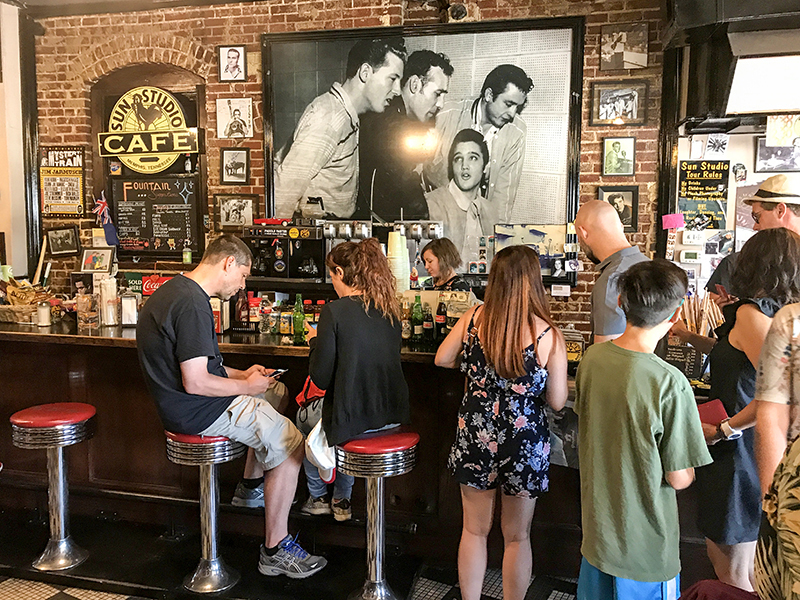 Memphis is one of my favorite cities…and not just because I’m a huge Elvis fan! You hit many of the highlights, for sure! I am always ready to go back to Memphis to explore a few more of its hidden treasures. Next time I will seek out your nephews’ bar! 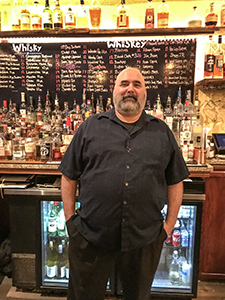 Go to Belle Tavern – it’s a great place and Chris is a great guy. Just up the alley in front of the Peabody.